After accidentally eating a Metamato possessed by the wizard Yin-Yarn, Kirby is banished to Patch Land, a world made of fabric. Kirby meets Prince Fluff who tells him Yin-Yarn has broken the world by stealing the magic yarn that holds it together. Kirby agrees to help and restore Patch Land. Thanks to the power of the Metamato, Kirby can transform himself into threads of yarn. 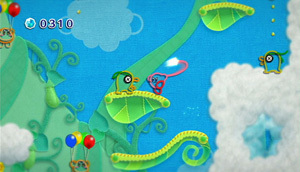 He can whip his arm to grab enemies, float down from high places as a parachute and transform the landscape around him. After clearing each stage, Kirby can return to certain levels to complete challenges and win furniture for his own room. After completing Carrie's 10th mission, set in Tube Town, you win the Famicom Fabric, which features a repeating pattern of the Famicom and Famicom Controller.